¶1. (C) Summary: Assistant Secretary Frazer, joined by Ambassador Ranneberger, met with President Mwai Kibaki on January 5 and January 7 to seek a path towards ending the political crisis stemming from the disputed December 27 presidential election results. She carried with her Secretary Rice’s message of an end to the violence and an agreement to dialogue among the principals in the electoral dispute for a political resolution. In both meetings, Kibaki was fully engaged and in control of his meeting, though members of his team comfortably voiced divergent viewpoints. In the January 5 meeting, Kibaki and his team focused on the need to end the post-election violence and their fear that Kikuyus were specifically being targeted. In the January 7 meeting, Kibaki was put on the defensive by A/S Frazer who sought an explanation and remedy for his naming of a partial cabinet on the eve of the African Union Chairman and Ghanaian President John Kufuor’s arrival to facilitate talks between he and Raila Odinga of the Orange Democratic Party (ODM). ¶2. (C) During both meetings, Kibaki said the right things in condemning violence and being open to dialogue to end the political crisis. Furthermore, Kibaki agreed in principle to forming a government of national unity and reconstituting his cabinet following talks with Odinga. However, his subsequent actions clearly suggested that he and his team were also moving towards consolidating power and that dialogue with Odinga was perhaps a fallback plan in whatever political strategy they had to end the political crisis. End Summary. ¶3. (C) During A/S Frazer,s mission to Kenya from January 4-11, she met with President Kibaki twice, on January 5 and 7, to reinforce the message from Washington: entering into dialogue with Odinga to find a political resolution to the current crisis is the way forward and an end to all violence on all sides is paramount. A/S Frazer pointed out that Kenyans had come out en masse to vote and largely did so peacefully in a process that appeared to be clean, up to the point of vote tallying. She emphasized that there were clearly problems with the vote count and this should be acknowledged and addressed by Kibaki in the interest of helping to heal divisions in the country. She reminded Kibaki of the more conciliatory tone he struck during his first address to the nation, which acknowledged that Kenyans had voted across the spectrum and which was a basis from which reconciliation could be built upon. A/S Frazer argued that political dialogue is the most viable way out of the current crisis as Kenyan courts are not considered impartial by ODM. ¶4. (C) While Kibaki repeatedly said in both meetings he was open to political dialogue, his position was quite clear: he won the election fairly; if ODM has concerns about the outcome they should take their complaints to court because once the Electoral Commission of Kenya makes a call on elections the courts are the sole constitutional remedy (and his government would obey their ruling, Kibaki said); and ODM is to blame for post-election fighting and it is orchestrating an organized campaign of violence. ¶5. (C) Kibaki emphasized that the real problem at hand from his government’s perspective is not the controversial presidential election result but the violence that has ensued, and he said ending it was their primary focus. Kibaki pushed the point that Odinga and other ODM leaders need to come out and call for an end to the violence. ¶6. (C) Martha Karua, the Minister of Justice and Constitutional Affairs and clearly one of the hardliners in Kibaki’s inner circle, attended the January 5 meeting (joined by then Foreign Minister Raphael Tuju, Foreign Ministry Permanent Secretary Thuita Mwangi, and Advisor Stanley Murage) during which she conceded that while some of the post-election violence may have been spontaneous, for the most part it has been pre-planned, she said. Kibaki echoed this point arguing that the youth are being paid to commit such acts. Tuju, a Luo, contended that ODM supporters were specifically targeting the Kikuyu, whom he said have exercised a lot of restraint up to now, suggesting that they could retaliate especially in areas like Nairobi where they are a majority, as Karua pointed out. Kibaki and his team emphasized they would not kowtow to the violence, which they consider ODM is using as “blackmail.” Mwangi recounted how he had to send a vehicle to Eldoret to rescue members of his family from the violence in that area. He claimed the post-electoral violence had been instigated by ODM and that it would have “unleashed” such violence even if it had won the election because of its desire for “majimbo” — the idea of decentralized governance with the connotation that major ethnic groups will govern autonomously over their own regions. ¶7. (C) A/S Frazer stressed that the USG condemned all violence and promised to continue to push the issue with ODM to call an end to it. She, however, asked Kibaki to demonstrate leadership by engaging with Raila in dialogue even in these difficult times; if former Presidents Nelson Mandela and F.W. de Klerk of South Africa could do it after years of violence, distrust, and political struggle in South Africa, surely he and Raila could do the same to move Kenya forward. After all, they have worked together in the past and they do know each other, perhaps too well, she added. A/S Frazer noted there were failures in leadership on both sides — that Raila should reign in those committing violence and that Kibaki should come out with a statement acknowledging electoral problems. ¶8. (C) A/S Frazer asked that Kibaki and Raila issue separate statements condemning violence, acknowledging there were real problems with the elections, and agreeing to dialogue (initially a joint statement was proposed and Kibaki was unopposed to it, but Karua and Tuju nixed the idea arguing that it would give the appearance of a “co-presidency.”); the statements would help heal and normalize the country*the most immediate need*and are exclusive of the issue of how the parties will actually come to a political arrangement on governance, A/S Frazer explained. While Kibaki expressed doubt that Raila truly wanted peace and said he was a man who spoke in “two languages” — something he saw as a significant obstacle to dialogue — he agreed to issue a statement, but never did. However, almost immediately after the January 5 meeting, the Presidential Press Service issued a statement that said the government was open to dialogue and forming a government of national unity. ¶9. (C) On the eve of President Kufuor’s arrival in Kenya to help facilitate talks between Kibaki and Odinga, Kibaki announced on January 7 the appointment of eight key cabinet members. A/S Frazer met with him that evening to express great disappointment and surprise at such action, particularly on the day before expected talks between ODM and PNU. She said the cabinet appointments were preemptive, that it seemed like Kibaki was taking the issue of cabinet positions off the negotiating table and was prepared to exclude ODM from any kind of coalition government, and that the USG was seriously considering denouncing the government should Kibaki not take remedial action. A/S Frazer also took Kibaki to task for not issuing the statement on vote tallying irregularities while noting that Odinga had honored his commitment to condemn violence and call off rallies given current political tensions. ¶10. (C) Kibaki argued that he was not preempting talks and that he only announced the partial cabinet to keep the government running — that it was only “logical” to do so, he said. Logical as it may be, the timing in naming a cabinet was bad faith, A/S Frazer told Kibaki. In the end, Kibaki said that he was open to changing cabinet positions if this was decided during talks with ODM, along with having the talks deal with a broader range of issues such as electoral and institutional reform. 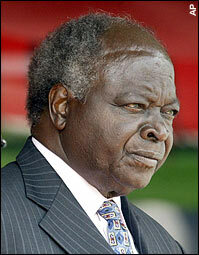 After intense negotiations with Kibaki and his team, it was agreed that Kibaki would issue a statement explaining why he appointed a cabinet when he did, clarifying that the cabinet was subject to change pending outcome of talks with ODM, and noting that nothing would be ruled out in these discussions. Francis Muthaura, Secretary to the Cabinet, and the newly appointed Foreign Minister Wetengula fought the idea of issuing a public statement clarifying the cabinet position appointment, but Kibaki was decisive in wanting it done; the statement was issued the following day. ¶11. (C) Comment: Kibaki and his team are fixated on the post-election violence and fail to truly own up to the fact that the flawed election results were the impetus to the crisis. They seem almost oblivious to the vote tallying problems, treating it as a minor detail that can be brushed aside and dealt with through legal means. Kibaki seemed reasonable and could be influenced with a well-argued point; members of his team, like Martha Karua, were clearly more hardline in their positions and do not seem truly interested in dialogue with ODM. Distrust of ODM was very evident in statements by both Kibaki and members of his team during these conversations. While Kibaki and his team are quite dismissive of ODM protests about the problems with the elections, the fact that Kibaki is open to dialogue with Raila suggests he has not completely bought into PNU’s narrative that they won the presidential elections fair and square; there may be hope yet that Kibaki will assert leadership to pursue a political solution with ODM. End Comment. ¶12. (U) This cable has been cleared by Assistant Secretary Frazer. The World should not be cheated by Kibaki for winning anything in 2007 Presidential election,he did not even had no supportive members of Parliament who won in their respective constituencies but he imposed himself by force to be the President and that is why he was sworn in privately at night in State House without Kenyans coming to witness his celebrations for winning and that was the reason why people went to streets to demonstrate the lies of winning.His Presidency was for Mount Kenya PNU Government but not for Kenyans people’s Government. Kibaki and his team planned that Chaos before the election and used the Police men to be trained as agents of the PNU in election.Can Kibaki tell the World why he won the election with only 45 members of Parliament and Raila to fail with 109 members of Parliament? Can any Mathematician in the World calculate that sum and get the answer with correct numbers to show who won? 109 Members of ODM and 45 members of PNU which one is higher to lead or win? If the blind people can hear about that number and feel it, then why people with eyes can not see the point? Even the electoral Commissioner Chairman Kivuitu said he did not even know who won the election can that make any sense to those who advocates for winning? The votes tallying had irreguralities due to forces from Kibaki’s early plans of PNU and was manned by Police officers under his orders through Francis Muthaura.And that is why he is holding the three out of six not to go to ICC of which he is afraid that they will name him. Therefore Doctors and Ambulances should be around the President and his team for high blood pressure they are not having a good sleep. But people always harvest what they plant. simply because they were being haunted by the shadow of Raila of which other areas does not see it. The Kenyans people should elect Raila to be the President of the Republic of Kenya because if only his shadow can chase evils from people what about himself when he will command the Republic?